During the year 1981 a number of projects were initiated to commemorate the foundation of the Federation of Irish Beekeepers Associations. The inaugural meeting of F.I.B.K.A. which took place at the Royal Dublin Society's Show grounds at Ballsbridge, Dublin, on 21st April 1881 was commemorated on the hundredth anniversary of that date with a lecture delivered by Dr. Oliver Langley and the launching of a book entitled -"Beekeeping in Ireland - A History" by Mr. James Watson. 1. The establishment of a fitting memorial to Irish Beekeepers of the past. 3. The planting of a collection of bee plants at a suitable centre, so that beekeepers and students of apiculture could observe bees at work on various flowers at different times of the year. 4. The provision of some guidelines for beekeepers who might wish to incorporate bee plants in their own gardens or apiaries. 5. The inclusion of a demonstration apiary containing various hive types which would portray the evolution of the beehive in Ireland, from straw skep to modern hive, also an observation hive and traditional "bee boles". 6. Aesthetic considerations - the encouragement of visitors - by adding interest and attractiveness through the use of a wide range of flowering plant species which would provide some colour throughout the year. A number of sites were investigated and one of these at Fota Island, adjacent to Cork City was found to possess the attributes deemed necessary for the successful establishment of a Bee Garden. This half acre site was very kindly donated by University College, Cork which had acquired the Smith-Barry Estate from Mrs. Bell, the previous owner in the mid-1970's and has since been managed by the Agricultural and Dairy Science Dept. of UCC. As well as expansive areas of agricultural land and woods, the estate contains a splendid mansion house, the grounds of which contain walled fruit gardens, ornamental gardens and an arboretum of great horticultural and historical importance, extending over more than thirty acres, in a magnificent parkland setting. It has long been a favourite venue for educational tours and the gardens are open to the general public from Easter to the end of September between the hours of 2.00 and 5.30 p.m. daily. Another major interest has now been added to the estate with the inclusion of a Wildlife Park where a wide range of wild animals may be viewed in natural surroundings. The Wildlife Park is due to open in June, 1983. At Congress of F.I.B.K.A. which was convened at Gormanston College, Co. Louth in July 1981, a sub-committee of the National Executive was formed whose function it would be to put the Bee Garden project into practice. 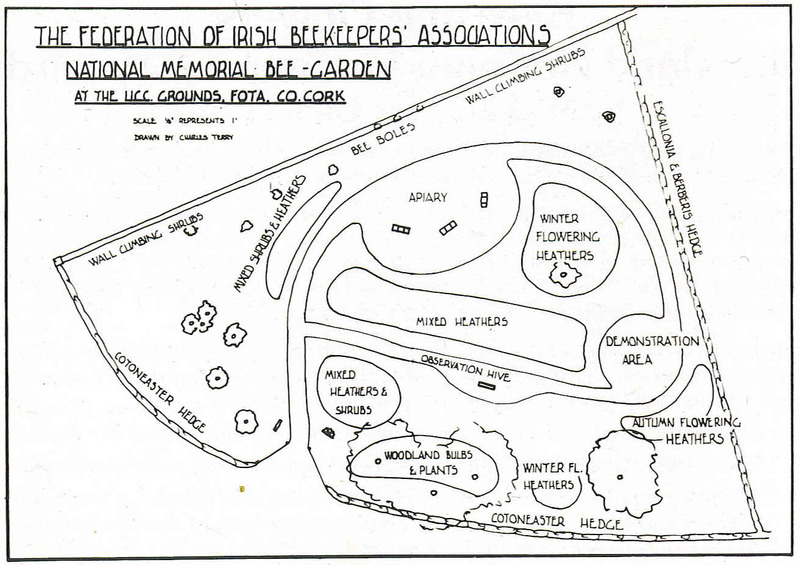 At a subsequent meeting which took place at The Munster Institute in Cork City, a working plan was evolved - detailing the layout, landscaping, planting and maintenance operations which would be necessary during the initial five-year period of establishment. The Committee are deeply indebted to members of the B.B.K.A. who gave their advice and supplied very valuable information regarding the Bee Gardens at Stoneleigh, Harrogate and Cornwall. 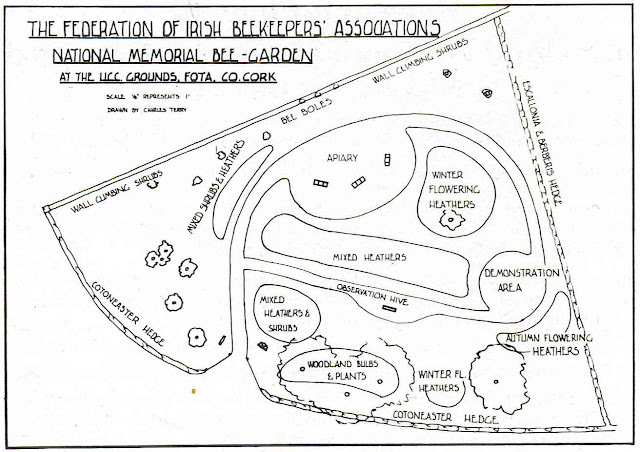 One of the most important pre-requisites for the success of the project was the availability of a number of dedicated voluntary workers who would be in a position to effect the various operations involved and this was probably the deciding factor in the selection of the Cork site as Co. Cork can boast of no less than six beekeepers Associations, all of which are affiliated to F.I.B.K.A. and the actual site itself is within the confines of the East Cork Beekeepers Assoc. The wisdom of this choice has been proved by the fact that the project has been brought to fruition within two years of its commencement. Co-operation, sponsorship and hard work have been the order from the start and the people who helped in so many, many ways are too numerous to mention here. Unfortunately, the Bee Garden Committee, together with the National Executive and Irish Beekeepers in general suffered a severe loss in the spring of 1983 through the sudden and untimely death of one of its most dedicated and well-loved members - Finbarr Dineen. The Bee Garden itself and especially the inscription stone which stands beside the entrance gate, and which he was instrumental in transporting, from near his home in Co. Laois, will serve as a monument to one of Ireland's most distinguished beekeepers. He has enriched our lives in so many ways. In selecting planting stock for the Bee Garden, subsequent maintenance was considered to be of primary importance. While the U.C.C. authorities have very graciously offered to maintain the grass areas, which cover about half of the site, it was agreed that the beds and borders should be planted with a wide range of flowering shrubs, woodland plants, bulbs and ground covering species including Winter, Spring, Summer and Autumn flowering heathers, and heaths. The species used will require the minimum of post planting treatment and within a few years should provide complete suppression of weed growth. Some specimen trees - already growing on the site - have been retained and add considerably to the attractiveness of the garden. These include groups of Mimosa, Palms, Magnolias and Maidenhair Tree, which provide a height dimension, shade and a suitable environment for certain plant species. A contrasting backdrop to the low-growing shrubs and heathers will be provided by flowering climbers on the two high boundary walls, while 'dual purpose' hedges of a variety of species demarcate the other boundaries.
. The date set aside for the opening of the National Memorial Bee Garden is Saturday, 21st May, 1983 when at 3.00 p.m. Mr. Austen Deasy, Minister of Agriculture, will perform the official opening ceremony.